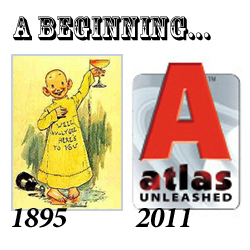 Ultimate vindication, and the Digital Space | Innovation, Inspiration... Atlas Unleashed! It’s been a while, filled with new publications, new terms (Day and Date Digital) and new company titles. We’ve come a long way in the past year with an incredibly successful debut at New York Comic Con. A few bumps here and there, an agreement to co-exist (Thank you, Jason Goodman), and a wonderful new affirmation that we’ve been onto something all along. See when one of North America’s largest comics publishers decides that the Digital Space is where their new readers are…I do believe that I’m experiencing ultimate vindication. Some have teased me endlessly about the Digital Revolution we are experiencing…claiming that “Web-comics are the way to go!”. I smile, give my 7 minute chat about how that was 1999…and move on. What is so motivating to us here at Atlas Unleashed is that comics are now being seen and read by new readers! These aren’t your official comicshop readers, they are in fact those massive-multiple online gamers, or sci-fi movie experts, or steam-punk manga girlz, or Middle-earth fantasy 24-hour role-players. That’s right, these readers belong to the world of mass media…a world that barely even knows that comic-shops exist! I had a revelation last year at I-CON Science-Fiction in Stony Brook, NY. I met some outstanding web cartoonists, who were into their 10th year doing stunning web-strips. I’d like to just plug them here: Ananth Panagariya & Yuko Ota of JohnnyWander.com fame. Their online dailies opened my eyes about possible delivery strategies for the modern-day version of daily newspaper strips. In fact, when I mentioned that to them, they both smiled and said that it was a better delivery system, because the series is systematically archived online. Every strip, every panel, every punchline and dramatic moment archived in it’s entirety! It’s all there for new readers and stalwarts alike. So total access any hour of the day to their entire creative run! That’s quite a leap from the age of newsprint. So while I believe that long-standing readers will still want something tangible in their hands, it’s already apparent that the Digital Space is upon us. New readers will want content in the format that are comfortable with, whether that’s available on their Playstation PS3, their Droid, or an iPad2. It’s now 4 years into the birth of Digital Comics, and I’m proud to be “Ultimately Vindicated”.